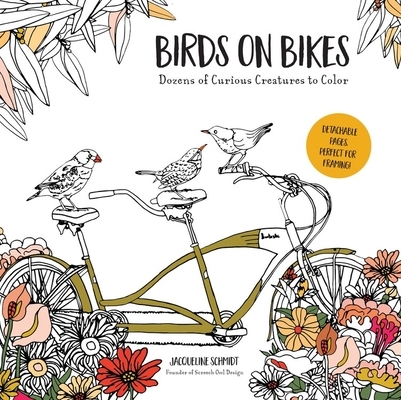 From popular illustrator and art therapist Jacqueline Schmidt comes a gorgeous new adult coloring activity book designed to create calm and inspire creativity. These whimsical designs will inspire and soothe you as you take the time to add your own personal touch of vibrant color. And the high-quality paper and pages that can be easily removed make these images ideal for giving and framing. So relax, enjoy, and let your imagination take over! Get out your colored pencils or markers and enjoy the calming pleasure of coloring. Jacqueline Schmidt is an artist, stationery designer, the author and illustrator of two picture books for children, and the creative force behind Screech Owl Design. Her immediately recognizable style has made her whimsical depictions of natural and urban imagery (birds on bicycles is a recurring motif) popular as stationery, prints, and textiles at retailers throughout North America, including Anthropologie, Papyrus, and many more. She has an MFA in creative arts therapy and early childhood development and is the former creative director for Moomah. Jacqueline grew up in New York City, and now makes her home in Brooklyn, NY, with her beloved husband, son, and cat.